I’m always looking for quick and easy lunch options that are tasty, carry well and can be eaten at room temperature – and of course healthy. 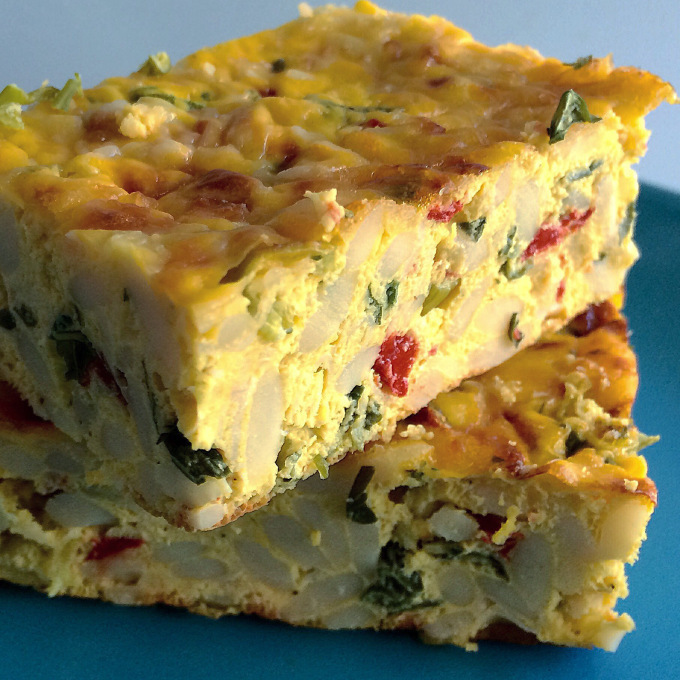 This frittata meets all the requirements. I make a dish of this on sunday and portion it out. It easy to grab for lunch or even a dinner with a side salad. Bring a small pot of salted water to a boil over high heat. Add the orzo and cook until tender, stirring occasionally, about 8 to 10 minutes. Drain pasta. In a large bowl combine the eggs, ricotta, and sour cream and stir until the eggs are beaten and the ingredients are combined. Add the cooked orzo, turkey, scallions, parsley, basil, red bell peppers, sun dried tomatoes, salt, and pepper. Stir to combine. Spray the baking dish with non-stick spray. Pour the mixture into a 1 1/2-quart baking dish. Bake for 25 minutes. Turn on the broiler. Sprinkle the parmesan cheese on top and place the pan under the broiler until golden on top, about 5 minutes. Remove from the oven and let set for 5 minutes. Cut into squares.